1 x 7/8-inch Sterling Silver St. Anthony Medal. This 14K Yellow Gold Diamond, Garnet and Pearl Pendant weighs 8.15 grams and measures over 1 inch by 1 inch. Made of 14K Yellow Gold plus genuine diamonds, garnets and cultured pearls, this piece features a weight of 8.15 grams. It comes ready for gift-giving in a complimentary jewelry box. Antiqued Madonna And Child Box 3.25X4.5X 2"
Antiqued Madonna and Child Box 3.25x4.5x 2-inch. 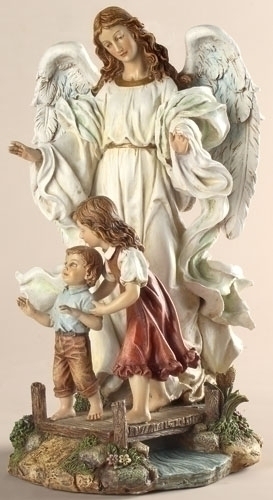 Holy Family Hand-Painted Standing 10"
Holy Family Hand-Painted Standing 10-inch is made to last for generations. Our 6 Millimeter Bead Tree Of Life Rosary features our money-back guarantee. NOTE: The photo may only show part of this product, but the 6 Millimeter Bead Tree Of Life Rosary is a full rosary. Our White Rosary Case 6-Pack features 6 units for one low price. 4" x 2.5" White Leatherette Rosary Case with Snap Closure. Get 50 pieces for one low bulk price with our 50-Pack of O Holy Spirit -Confirmation Holy Card. Only available in this bulk pack. O SPIRIT -CONFIRMATION 2" x 4" Paper holy cards with gold edges. Packs of 50 holy cards, prayer on back. Get 100 pieces for one low bulk price with our 100-Pack of God Made Us A Family Holy Card. Only available in this bulk pack. Family Prayer 2"x4" Gold Embossed Italian Holy Card with Prayer 100 Per Pack. Our 14K White Ruby Cross Pendant features our 60-day money back guarantee and free Shipping Insurance, as does our entire line of religious jewelry. Part of our Religious Pendants line, this Solitaire Cross Pendant features a weight of 0.909 DWT, which is the equivalent of 1.41 grams.